Life under the rule of the winged Skyborn race isn’t so bad for Claret Spencer, the star mechanic of an independent repair shop. She can patch up just about anything…but when a certain cravat-wearing customer turns her life upside-down, she finds herself pulled into an epic, city-wide conflict that’s going to take a lot more than elbow grease to fix! 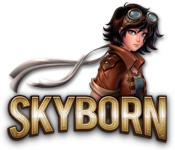 Join Claret on her journey through a tale of magic, metal and mystery as she unravels the secrets of the Skyborn!